UN agencies working in Yemen exercises widespread financial corruption and illegally earn from lavish funds provided by donors in humanitarian aid for the needy in a war-torn country, a Yemeni news agency reported Sunday. UN expenditures and method to manage Yemeni crisis have raised doubts among Yemenis, said Khabar Agency, amid evident signs revealing many corruption acts practiced by UN groups. UN Yemen-based humanitarian workers profit from false projects that only address the minimal humanitarian aspects out of proportion with the problems marketed to raise funds from donors, reliable sources told the agency closely-linked to late president's son, Ahmed Ali Saleh. Their "corruption is as rife as tricking, bribing and appropriating huge funds," the sources added claiming that "this is one of the reasons behind the UN's involvement in prolonging the war in Yemen." Yemen war has left tens of thousands killed, hundreds of thousands injured, 3 million displaced and most of the population in need for a type of humanitarian aid and immediate protection, including 14 million people risking famine and some 1.8 million children suffering malnutrition. During the Yemen 4-year conflict, the UN has received some US$ 8 billion, out of 12.4 billion the organization asked for to cover its human projects in Yemen. Those amounts have been channeled into WFP, UNICEF, WHO, UNHCR as well as other UN and international agencies and local NGOs, according to the sources. But donated funds are "wasted by the UN on rented houses and cars and travel tickets for its foreign staff who are paid, among other allowances, salaries as lavish as doubles of those received by US and European senior officials." The cash aids infused in US dollars into Yemen via humanitarian groups are only deposited into bank accounts after being exchanged at black market, losing 54 percent of their value, the agency quoted economists as saying. Such accusations come to corroborate vast believes among Yemenis that the large food aids announced by the UN hardly reach the needy. Being in kind, humanitarian aids provide very limited economic gains, if any, and have no impact on poverty alleviation, since they benefit less the needy than warring parties who distribute them to loyalists, sometimes to combating personnel or even sell them at black market, observers told the agency. On December 31, the United Nations' WFP directly accused Houthis of fraud and thieving food aid intended for millions of Yemeni people in need and selling them at markets in rebel-held provinces and cities in north of the country. WFP director David Beasley said after the Program learnt many people in the Houthi-controlled capital, Sana'a, have not been getting, its own investigation had found "evidence of trucks illicitly removing food from designated food distribution center" in Houthi-controlled areas as well as fraud by a local food aid distributer connected to the Houthis' Education Ministry. "These incidents of fraud amount to stealing food from the mouths of hungry Yemeni children," AP quoted Beasley as saying while "children are dying in Yemen because they do not have enough to eat.. It's a disgrace, criminal, it's wrong, and it needs to end." 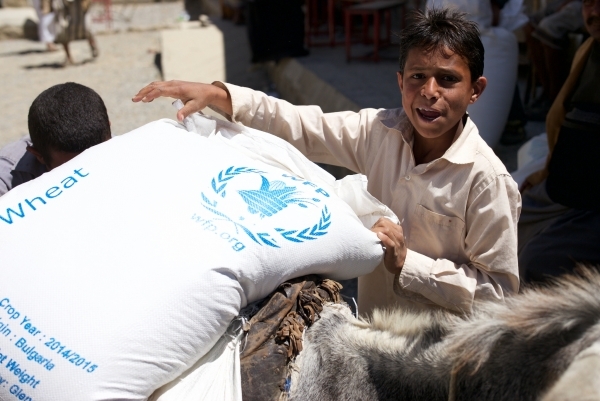 In a letter to the Houthis' leader Abdulmalik al-Houthi, WFP top official wrote that aids did not reach 40% of intended beneficiaries in Sana'a, and, if the rebels did not investigate and put an end to theft, the organization would suspend some assistance, potentially effecting nearly 3 million people.